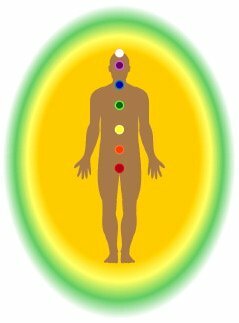 This is a unique site offering resources on auras, aura cleansing, guided meditation techniques, chakra meditation, clairvoyant readings, aura reading, past life readings, spiritual healing and much more. In reality, we live in an ocean of energy with infinite potential. Everything around you, including you, is energy. The electromagnetic field of energy surrounding your physical body forms your aura and is a part of your spiritual energy system. There are seven layers of energy within your aura that correspond to your seven chakras. For example your seventh layer has a direct relationship to your seventh chakra. Every thought, feeling and experience you have affects the vibration of this ocean of energy. Everyone and everything--even each place--has an energy field. You've probably even experienced this before. Have you ever been in an interaction with someone--or even a place for that matter--where it was pleasant enough but something did not sit well with you? You may have even started to feel agitated. In contrast to that you may have experienced bliss with a different person, where you felt amazing through that interaction... A number of factors could be at play here, but it's quite possible that you're picking up on the emotional and vibrational tone of those energy fields and their auras -- perhaps without even realizing it. Likewise, objects carry distinct vibrations. A gift given to you in love feels very different than a gift given to you out of obligation or with strings attached. The object may be the same in each case, but the energy the object carries will be clearly different, creating that sense of ooh…now…um...this is awkward. Similarly, have you ever been to a place that felt sacred to you--like a temple, a cathedral, or a beautiful place in nature? Or on the other hand, have you ever been somewhere where the energy felt somehow off--for example, in a room where the tension was so thick, you felt you could 'cut it with a knife'? These are clear examples of energy affecting places, and the impact on us -- in ways that many people have experience in day to day life. It is also possible for you to become increasingly aware of energy vibrations and auras in yourself, others, objects and places. Practices like spiritual healing, learning how to meditate, and developing psychic abilities all support you in becoming conscious of energy. Lastly, as an exploration exercise for you while you navigate our site, we encourage you to experience what your energy field is doing. Do you somehow feel lighter as you read through and practice the meditation exercises? Does it bring up emotions for you? and so forth. Simply staying tuned in will allow a tremendously level of spiritual healing to take place. If you are just starting to open up the door to spiritual awareness, feel free to postulate and imagine…if I could experience this, how might I be able to experience it. Increasing your spiritual awareness starts the process of spiritual healing which allows emotional and body healing to take place. Eventually, if you keep at it, you will even be able to support others in healing and becoming more conscious--without getting preachy and trying to change others! Transforming yourself ultimately transforms your family, your community and the world around you. Most importantly, the journey of becoming more aware of auras and spiritual energy begins with choosing to heal yourself.